Get a $10 Free Calling Card Bonus When You Sign Up for Your Online Phone Card Today! That’s up to hundreds of minutes in free calls to friends and family! 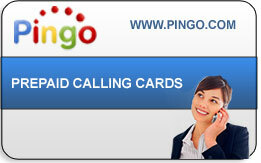 Pingo’s Online Phone Card Is the Only Calling Card You’ll Ever Need. Get dialing. Sign up for you international calling plan today! Stop Losing Money on Over-Priced, Replaceable Calling Cards! No hidden charges or fees. The rate you see is the rate you pay for your online phone card! For Cheap Calling Card Rates, Excellent Voice Quality and Spectacular Phone Service, Sign up for the Pingo Online Phone Card! It’s the Only Calling Card You’ll Never Have to Replace!